Jake Bernstein’s Daily Sentiment Index (DSI) is a proprietary sentiment indicator which we’ve looked at before a few times for different markets. It is not a commonly used index since what goes into its composition is not known and unlike the AAII’s weekly sentiment survey, the results are not free. There are two sources that I know that provide data from the DSI. One is, of course, directly from Jake’s own website for about $2,000 a year. The other is from EWI in their Futures Junctures newsletter service which is more affordable at $59/month. …within the context of my trading model—setup, trigger and follow through—market sentiment is a setup. In other words, it is not a call to action but rather a leading indicator or a pattern that alerts traders to potential action—a timing trigger. You might recall that the sentiment for the US dollar was at an extreme low in late August 2009 when the US dollar index was at 78. Based on a contrarian reading, I was expecting a sizable rally since that is what had happened before when there was so much pessimism. Instead the dollar floundered and fell slightly. Right now it is trading slightly higher. The correlation between DSI trend and price trend is high. As prices increase, bullish sentiment rises. As prices fall, bullish sentiment declines. Daily sentiment highs and lows correlate closely with price highs and lows. 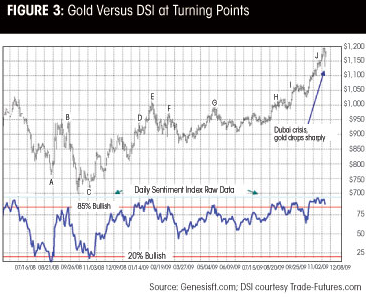 Daily sentiment can remain excessively bullish as prices increase. Hence, the small trader is not always wrong at tops. The opposite can occur at extremely low levels of DSI correlated with low prices. DSI is a valuable tool that is not derived directly from price but from trader perception of price, and it is, therefore, a reasonably independent variable. DSI is best used as a leading indicator that should ideally be combined with timing triggers. Some of the institutional users of the DSI convert the raw data (i.e., slow it down with moving averages) to improve its stability, and they then use it as a timing indicator. The bottom line? Daily sentiment and contrary opinion have a strong place in an analytical and/or proprietary trading approach, but they are not the holy grail solution to trading accuracy and profits. If you really want to gain an edge and not only learn the in’s and out’s of the DSI but also how to specifically use it to trade profitably, join me next Thursday at the first ever webinar on this indicator by its creator, Jake Bernstein.